There are certain things that are essential to Easter morning, like beautiful toys and irresistible chocolate treats. So, in this wonderful basket, we brought together all of those classic elements to create the perfect holiday gift! 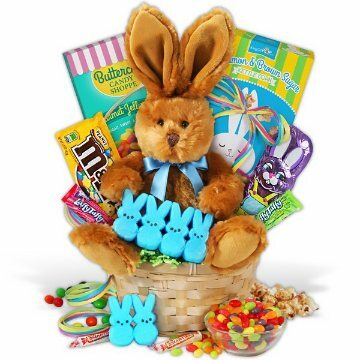 Complete with bright sweet candies, crisp handcrafted popcorn, and a gorgeous stuffed bunny, this lovely arrangement will make Easter morning absolutely unforgettable! This gift includes the following: Bunny with Bow Tie, Jelly beans by Buttercup Candy Shoppe - 3.5 oz. Cinnamon & Brown Sugar Popcorn 1.4oz., Peeps - Assorted Colors, (2) Smarties - assorted flavors - 7 g, (2) Laffy Taffy, Peanut M&Ms - 1.69 oz., Double Crisp Chocolate Bunny - 4.25 oz.